This silver infinity CZ stone wedding band ring is the perfect ring to slip on your finger when you are saying your "I dos." This beautiful wedding band, which is crafted in .925 sterling silver, features a carefully designed looping infinity design going around the entire band of the ring. Above and below the infinity design on this ring from Apples of Gold Jewelry is a row of 40 cubic zirconia stones. That totals 80 CZ stones, and is the equivalent of 0.48 carats of diamonds. The ring has a 10mm width to it, and while it is a little larger than most wedding bands, it is stylish and simply beautiful. 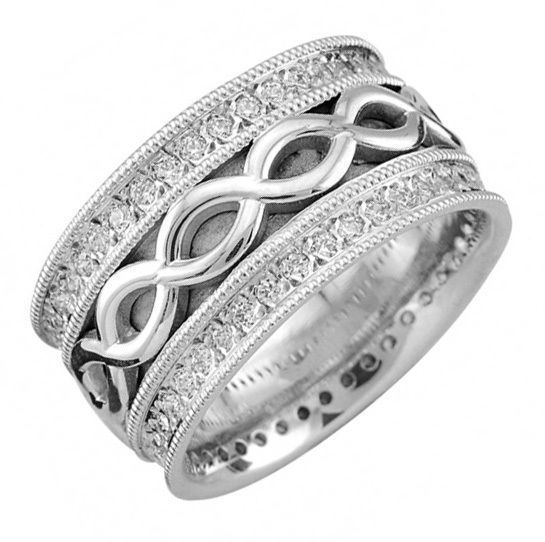 We guarantee our Silver Infinity CZ Stone Wedding Band Ring to be high quality, authentic jewelry, as described above.